From my vantage point at the corner of East Main Street and Mill in Waterbury, Connecticut, I can see a double line of French soldiers that stretches from horizon to horizon almost to Breakneck Hill, Middlebury. 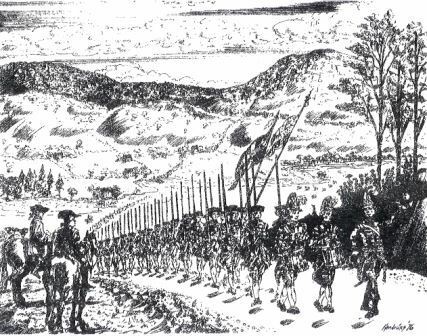 General Rochambeau and his men under arms are marching peacefully across Connecticut today under a scorching hot sun. They must be miserable wearing those white woolen uniforms! But, true to form, they hold heads high and march in perfect formation. I am in awe and am truly amazed and at the sight of this long, white, line!